Hurricane Harvey dealt a devastating blow to our customers, families and friends in coastal Texas. Now, as thousands of church volunteers begin the relief and rebuilding effort, HOPE Coffee is committed to partnering the best we can—with coffee. 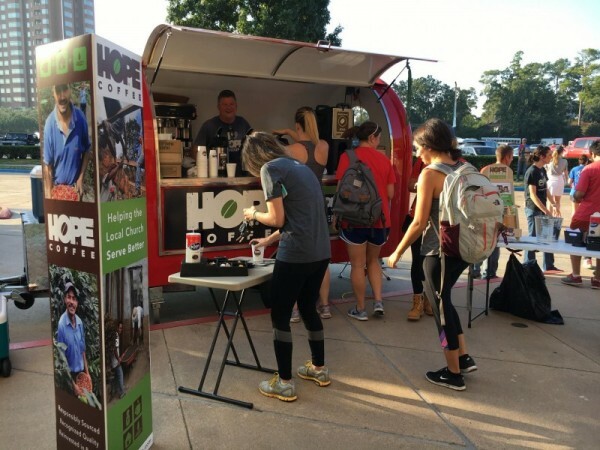 The HOPE Coffee Team will serve FREE HOPE COFFEE and water to the volunteers as they serve, and to the victims in the communities being served. Coffee brewing system: $3,000 Donated by HOPE Coffee, Inc.
From the beginning, HOPE Coffee has existed to help the local Church “serve better” by meeting needs in their communities. If you are a HOPE Partner Church, please consider collecting donations for “HOPE for Texas” as a part of this Sunday’s coffee service.